Lake Tara's Nature Habitat Needs Your Help ! We are now at the next step to designing the lake at Lake Tara for reconstruction into a park. I now have community service working the area which started in May. You will be seeing clean up people on Tara rd . If you notice a area that has a lot of trash and needs to be picked call 770-473-1119 leave a message and I will get someone out there to pick up. I will be using community service to help clear out the lake bed of the trees and weeds that have grown and to clean up on the bed such as trash, tires and debris from people still fishing as of today. So I am coming to you to ask for money donations and item donations. If anyone has equipment such as weed eaters, trash bags, will barrows, chain saws, hand saws, or if anyone is a driver of large equipment that would donate their time and skill to help move this on and to help keep the cost down on the reconstruction of the lake. Very important we need a engineer at a good cost so if anyone knows of one let me know please. I need to get estimates. Don'tt forget that all donations to lake Tara can be used on income taxes if you itemize. Please help with a donation so we can make a dream come true for the local residents as well as all residents to have a place for your families to go and enjoy. Please visit The Web Site www.laketara.org. We will see you at our yard sales and at the booth. 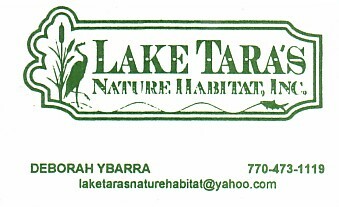 Lake Tara's Nature Habitat, Inc is a Non-Profit organization recognized by the IRS 501(c)(3) and the State of Georgia. No members of the organization receive compensation. Donations monetary and other are needed to complete the goals of the organization. A receipt for tax purposes will be issued. Lake Tara is located in Clayton County, near Jonesboro, GA.
Lake Tara once over 26 acres is now less than 4 acres. The dam needs to be repaired. The Goal of Lake Tara's Nature Habitat, Inc is to restore Lake Tara. Creating a Community area for families with fishing, walking trails, etc. A Public Park and also an area where Schools and Groups can have an Educational experience. To retain an area for wildlife and greenspace in an over-developed area south of Atlanta GA.
New Members are Welcome to Join ! Click on Lake Tara's Nature Habitat,Inc. Business card to access to Official web page ! Currently we are in need of donations from both Business and Individuals. Any amount will be appreciated. The Dam needs repair, a costly process ! The Wildlife and Fish will be much Happier once the Lake returns! We look forward to the Community responding positively ! Thank You !!! Peachtree Peddlers for Your Support ! Thank You to the United Way for the Community Grant. Lake Tara's Nature Habitat, Inc.
You can sign up to shop online through iGive.com a portion of the proceeds benefit Lake Tara's Nature Habitat,Inc. The shopping window download is a nice feature. Help Lake Tara's Nature Habitat, Inc. Without shopping through the Mall. Click here to view Lake Tara's eBay listings ! You can donate directly to Lake Tara's Nature Habitat. Download the Lake Tara Toolbar !